Bluetooth Wireless Presenter Mouse + Media Player Remote Control Software. For Nokia/S60/Moto/SE Phones! UNIQUELY SIMPLE, EASY & POWERFUL. YOUR Increased productivity + Fun! -Uniquely easy to setup, uniquely easy to use, uniqely smooth mouse movement, uniqely powerful functions. Simple, stable and straightforward. -Joystick Mouse control is intuitive. Numpad function mappings are easy to remember, touch & feel without looking at your phone. With WMouseXP, you can use your phone's Joystick as your wireless mouse, use your phone's numpads as a presentation (PowerPoint/PPT) remote control and media player remote control (like a stereo remote) - all wirelessly via Bluetooth, directly from your phone. This software requires a Java-Enabled Bluetooth mobile phone + Windows XP/Vista with Bluetooth (USB, integrated, etc...) on BlueSoleil or Microsoft or Broadcom/WIDCOMM Bluetooth Stacks. Requirements? "Java Enabled Bluetooth phone (JSR-82)" or S60 mobile phones + Windows XP SP2 or later with Bluetooth Hardware on BlueSoleil or Microsoft or Broadcom/WIDCOMM Blueooth Stacks. How to Setup? 1. Download and run the Installer. 2. Get a USB Bluetooth Dongle. Make sure your PC's Bluetooth is plugged-in & ready. 3. Start WMouseXP (icon on your Desktop). Press the "Not installed on phone?" 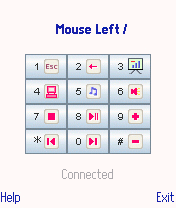 button in this WMouseXP PC Side program to send the Mobile Side program to your mobile phone and install it there. (Make sure your phone's Bluetooth is on as discoverable - "Show to all".) 4. On your phone, start the mobile side WMouseXP program, allow it to access Bluetooth (On some S60 phones, you MUST press the (left) softkey for "Yes" explicitly - because pressing the Joystick "in" would result in a default "No"), until you see "Awaiting PC Side". 5. On your PC's WMouseXP, press the "Connect" button. Done! Need more detials? Just click the top-left "Help" menu. WMouseXP - Easy to setup, easy to use, uniquely integrated & powerful.